I once saw a wind turbine blade traveling on an open-bed truck on a back country highway. It was more than a hundred feet long, white, smooth, and curved, and it filled me with awe. How very far we have come since a fictional Don Quixote tilted at windmills: we build these giant blades that sweep an acre (!) with each spin and mount them on towers taller than the Leaning Tower of Pisa. So there was this blade being trucked along somewhere. How did they decide what it should look like and where to put it? Once you decide you want a wind farm (a network of individual wind turbines connected to the power grid), the first thing to do is to carry out detailed studies of weather, wind, and terrain at candidate sites. Then, the industry standard is to perform simple parameterized empirical simulations for wind turbine wakes using models such as the WAsP software suite. However, with growing computational resources and access to high-performance computing, you can design every aspect of the wind farm using CFD: from individual blade loading (valuable for blade design), to optimizing the location of the individual turbines to prevent interference from the other wakes, to estimating the impact of the environment on the tower and its associated structures. For example, Hannah Johlas, a graduate student at the University of Massachusetts Amherst, whose research is co-funded by Convergent Science, studies offshore support structures using CONVERGE. 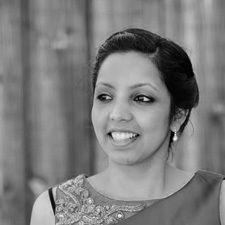 Other research has focused on the physical impact of the wind farm on the environment (such as land surface temperature and crops) or the weather. Local governments and stakeholders can find results from CFD persuasive. But there’s a catch: getting detailed and accurate results from CFD in these scenarios can be computationally expensive and time-consuming for the engineers running the simulations. 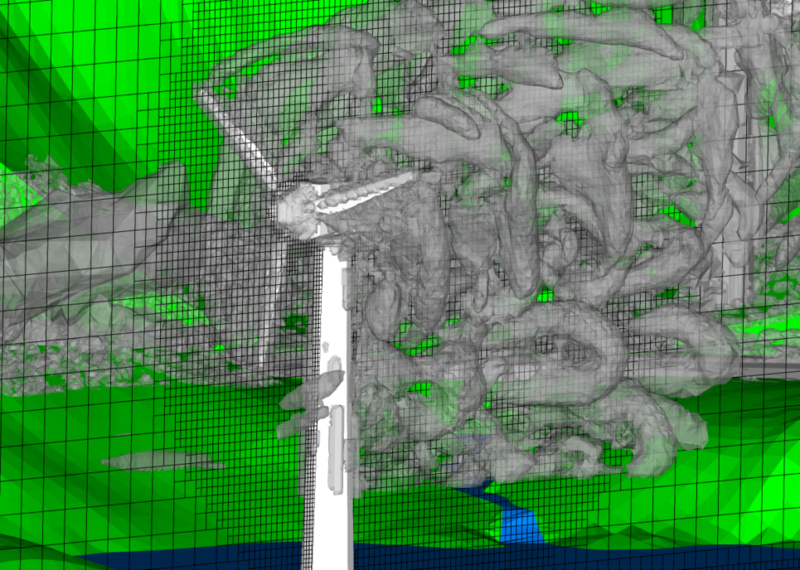 CONVERGE CFD can provide a detailed picture of any aspect of wind farm design and optimization and contains several features, including autonomous meshing, genetic algorithm optimization, and smooth handling of complex moving geometries, to make the cost of these simulations manageable. Although wind farms have historically been sited on flat terrain, such as offshore or in Iowa, which now leads wind energy production in the United States, wind farms are increasingly situated in more complex terrain, such as various sites in California. In the figures below, we show CONVERGE results of wind flow around four wind turbines placed in a complex terrain, containing a hill, a road, and a truck moving on the road. 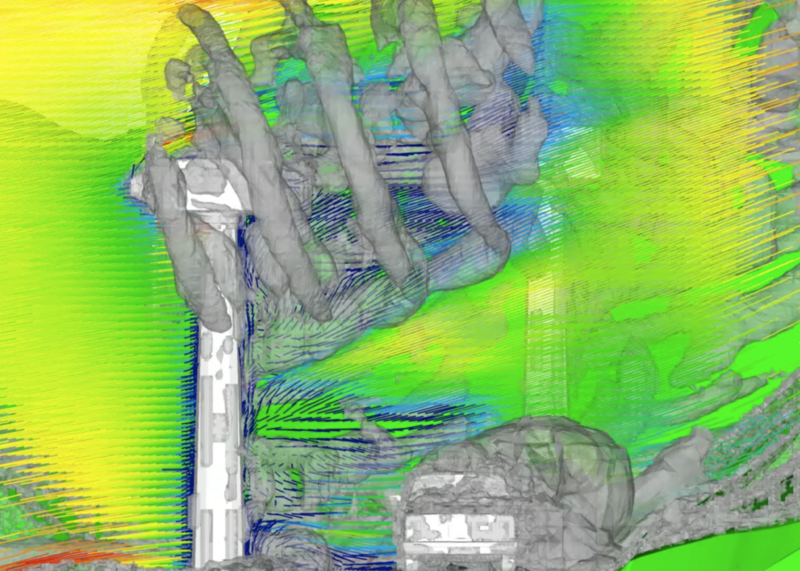 The most powerful feature used here is CONVERGE’s autonomous meshing capabilities, including Adaptive Mesh Refinement (AMR), which adds cells exactly where additional resolution is required. Here we also use boundary embedding, which moves along with the blade. Previous CFD studies have used an actuator disk simplification for the wind turbine with a bulk source term, but this neglects the impact of the blade motion on the downstream wake. CONVERGE can resolve the rotating blade motion and the consequent downstream wake effects (Figure 1). In Figure 2 below, you can see an isosurface of the Q criterion (a visualization of the vortex structure) with additional mesh resolution along the blade. By including blade motion instead of an actuator disk, the turbulent wake is resolved more accurately. This, in turn, lets you observe the flow field around a complex piece of terrain such as the hill (Figure 3). It can be useful to look at the effects of other factors on the wind farm as well.​ ​In Figure 1, you can see​ a truck on the road in the simulation domain. With AMR and with boundary embedding along the surface of the truck,​ ​CONVERGE can resolve the​ effect of the moving truck on the flow field, as well as the interaction of the wakes of the turbines closest to the road and the truck. CONVERGE offers many features to optimize and design a wind farm. You can set different roughnesses for different surfaces in the terrain (e.g., water, farmland, and hills). You can allow the towers to rotate and respond to changing winds (specified as a source on the boundary of the domain). 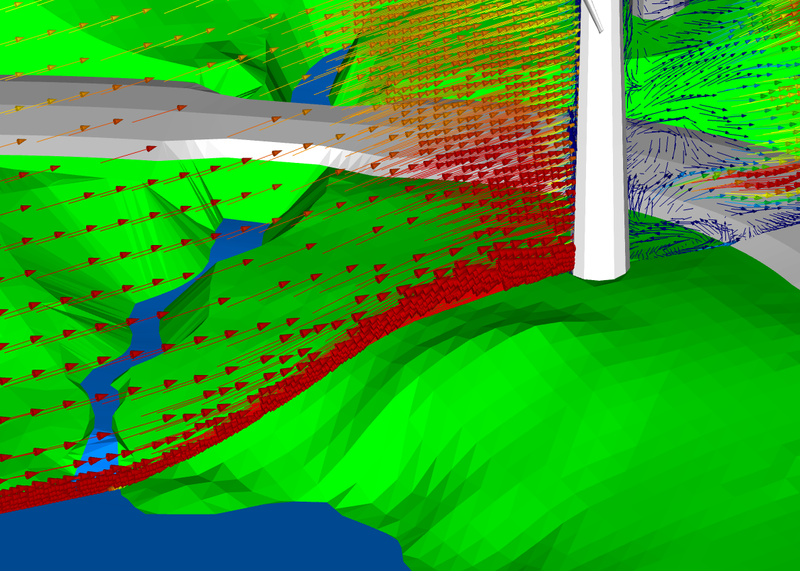 You can specify an actuator-line model to simulate wind flow through a wind farm. When designing tower placement and height to compensate for wake effects, you can use genetic algorithm optimization (available within CONVERGE) to spawn a number of candidate configurations, which can save you design time upfront. You can then use CONVERGE CFD simulations to determine the optimal configuration for a wind farm with your particular topography and wind conditions. Countries all over the world have been investing steadily in infrastructure to increase wind capacity, and the world’s cumulative capacity for wind power has tripled in the last five years. With the growing push toward renewable sources of energy, it is imperative to have tools to ensure effective planning for wind farm design. CONVERGE CFD can accurately (and easily!) simulate many aspects of wind farms so that you can take full advantage of this increasingly popular source of energy.